Using Solar Power For Homes In Canada – How Feasible Is It? Home/Green Living/Using Solar Power For Homes In Canada – How Feasible Is It? Considering using solar power, many would not think Canada to fit in the list, due to the cold climatic conditions here especially in those chilly winter months. But if you think positively, there could still be huge potential for solar power. Canada has a different topography with lot many open spaces which if tapped can give real boost the use of solar power. In addition there are other options like thermal, passive heating and Photovoltaic (PV) applications that can really be used to promote the solar energy on large scale. Due to the vide stretches between the two metropolitans, many small communities can be created at the various distances and separated from the larger grids. Many people are of the opinion that creating such small communities can be more feasible to use the solar power system for their homes than spending huge amounts of money to supply power from the grid. It will prove to be more economical for the individuals to get the solar power in their homes; websites can be of great help in providing the complete details about building the solar system at a very reasonable cost for your homes. Canada may not be lucky to get the sufficient sun shine, but during summer months plenty of sun shine is available, that too for a longer period of the day. This sunshine can prove to be sufficient in providing solar power to homes and in small communities, in months when the days are shorter especially during winter month’s additional panels and proper angling of the panels with additional alternatives can definitely help in tapping more sunlight. Some of the alternatives which can be considered are wind turbines, hydroelectric and use of backup gas generator; these options eventually are proving to be less expensive. With the improvisation of technology in solar power, photovoltaic cells are more efficient; these cells can easily be fitted in the roofing tiles and are capable of picking light spectrums. 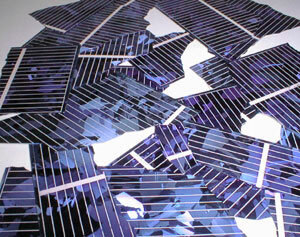 Exploring this can really give boost to the solar power; just imagine the potential which are unlimited. This has been proved beyond doubt that solar power is totally clean, cheap and more efficient as compared to any other form of energy. Canada has made a lot of progress, so far solar power is concerned; people and industrial houses are shifting to more clean and free source of energy. Many other commercial and navigational markets have already shifted to solar power; the recent has been using solar power for traffic signals and also for water distribution. From October 2009 the government in Ontario launched a program called Feed In Tariff or FIT for short to encourage the use of renewable energy, especially solar power. Such programs are being encouraged to give solar power to small residential areas. In 2010 largest solar array of the world was commissioned providing power to 12000 homes in Sarnia Ontario. The project produces 80 megawatts of power, by 2015 it is expected that more than 2600 MW power can be produced. You have many online options to find right panels for your home, installing such panels can really help you in using solar power.